LyncPix Lts. (“Us” or “We” or “LyncPix”) provides the web.lyncpix.com site and various related services (collectively, the “site”) to you, the user, subject to your compliance with all the terms, conditions, and notices contained or referenced herein (the “Terms of Service”), as well as any other written agreement between us and you. In addition, when using particular services or materials on this site, users shall be subject to any posted rules applicable to such services or materials that may contain terms and conditions in addition to those in these Terms of Service. All such guidelines or rules are hereby incorporated by reference into these Terms of Service. BY USING THIS SITE, YOU AGREE TO BE BOUND BY THESE TERMS OF SERVICE. IF YOU DO NOT WISH TO BE BOUND BY THE THESE TERMS OF SERVICE, PLEASE EXIT THE SITE NOW. YOUR REMEDY FOR DISSATISFACTION WITH THIS SITE, OR ANY PRODUCTS, SERVICES, CONTENT, OR OTHER INFORMATION AVAILABLE ON OR THROUGH THIS SITE, IS TO STOP USING THE SITE AND/OR THOSE PARTICULAR PRODUCTS OR SERVICES. YOUR AGREEMENT WITH US REGARDING COMPLIANCE WITH THESE TERMS OF SERVICE BECOMES EFFECTIVE IMMEDIATELY UPON COMMENCEMENT OF YOUR USE OF THIS SITE. These Terms of Service are effective as of today. We expressly reserve the right to change these Terms of Service from time to time without notice to you. You acknowledge and agree that it is your responsibility to review this site and these Terms of Service from time to time and to familiarize yourself with any modifications. Your continued use of this site after such modifications will constitute acknowledgement of the modified Terms of Service and agreement to abide and be bound by the modified Terms of Service. LyncPix provide users with access to certain materials to help them create and manage client galleries through the user of its web application, website hosting services and other tools and services (the “Services”). We neither endorse nor assume any liability for the contents of any material uploaded or submitted by third party users of the site. We generally do not pre-screen, monitor, or edit the content posted by users of communications services, chat rooms, message boards, newsgroups, software libraries, or other interactive services that may be available on or through this site. However, we and our agents have the right at their sole discretion to remove any content that, in our judgment, does not comply with these Terms of Service and any other rules of user conduct for our site, or is otherwise harmful, objectionable, or inaccurate. We are not responsible for any failure or delay in removing such content. You hereby consent to such removal and waive any claim against us arising out of such removal of content. See “Unauthorized Use of Materials” below for a description of the procedures to be followed in the event that any party believes that content posted on this site infringes on any patent, trademark, trade secret, copyright, right of publicity, or other proprietary right of any party. You hereby grant LyncPix Ltd. a worldwide, royalty-free, non-exclusive license to host and use the Content in order to provide you with the Services and hereby represent and warrant that you have all the rights necessary to grant us such license. 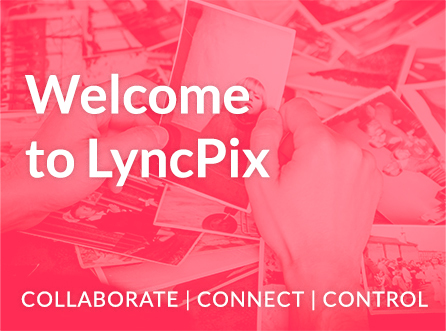 The license includes the right to use your Content in connection with LyncPix’s operation, marketing and promotion of the Site, provided such Content is attributed to you in accordance with the credits (i.e. business name, profile picture, photo title, descriptions, tags, and other accompanying information) if any and as appropriate, all as submitted by you. Although we try our best to restrict the ability of users and visitors to the site to make high resolution copies of content posted on the Site, we makes no representation and warranty that content posted on the site will not be unlawfully copied without your consent. We do not restrict the ability of users and visitors to the site to make low resolution or ‘thumbnail’ copies of content posted on the site and you hereby expressly authorize LyncPix to permit users and visitors to the Site to make such copies of your content. You are responsible for any content that you have posted to the site and that may be lost or unrecoverable through your use of the Services. We may, but have no obligation to, monitor content on the site or websites created using our Services. We may disclose any information necessary or appropriate to satisfy our legal obligations, or operate the Services properly. We may also refuse to post, remove, or require you to remove, any content, in whole or in part, alleged to be unacceptable, undesirable, inappropriate, or in violation of these Terms of Service. If you believe any materials infringe your copyrighted works, you may provide a notification of claimed copyright infringement to support@lyncpix.com for copyright complaints. This policy sets out an acceptable level of conduct relating to the use of our Services, it is designed to ensure that the Services received by the majority of the clients are not negative impacted by potential fraud and abuse of our product. Our client gallery product is meant for individual photographer business use only, each “collection” is meant to be created for a single event and shared with client as such. We reserve the right to charge additional fees to users who go above the fair usage amount that is determined to be more than 20GB per collection, and 100GB of bandwidth per month. We have the right to terminate any account immediately if it is determined that there is unlawful, prohibited, abnormal or unusual activity. Each user is entitled to create one account. Free account is entitled to receive a maximum of 5GB of total storage. Professional, Business, Premium, accounts each have a max storage limit of 500GB, 5TB, Unlimited respectively. Subscriptions are for the term you select when you subscribe. Subscription will automatically renew at the end of each billing period for the same duration as the original term, unless the subscription is terminated or cancelled by you or LyncPix prior to the end of the term, either through the online platform or by written notice to support@lyncpix.com. You agree that upon the renewal of the term, the credit card designate on your account will be billed the applicable fee in effect at the time of renewal. We reserve the right to terminate your subscription in the case that we are unable to process the payment with your credit card on file. You maybe upgrade, downgrade or cancel your account at any time, in the case of a downgrade or cancellation, a discount credit will be issued to your account for the difference in the cost over the remainder of the term. This credit can be applied to any future service with LyncPix one year from the credit issue date, and is not transferrable to a cash refund. Published collections will stay online as long as the user’s subscription is active. In the case a subscription is cancelled, all images will be kept for 60 days from the cancellation date, during which the user could re-activate the account and retrieve all the images. Each account may be cancelled and re-activated a maximum of one time. Once the subscription has been cancelled for 60 days, all images will be removed from our database. In the event that we are not able to keep your content for the said length of time, we reserve the right to refund you a pro-rated amount of what was originally paid, and be relieved of any further obligations. We may modify, suspend or discontinue any of the features attached to the accounts at any time at our sole discretion and without prior notice. LyncPix resizes the images you upload for displaying and for client download purposes. You are able to deliver via the Download feature the resized image which has a maximum size of 3500px on the long edge (referred as High Resolution photos on the site). As a Starter, Professional, Business or Premium account user, you also have the option to deliver the Original size image by changing the download setting for each collection. You take full responsibility for using the features offered by LyncPix and you hereby expressly and irrevocably release and forever discharge LyncPix from any actions, suits, losses, or liabilities arising directly or indirectly out of your use of the site and its features and Services. For the self-fulfillment option, you must set out your own Terms of Sale, Return/Exchange Policy and any other statements that may apply, for the sale of prints and other products through your Store. LyncPix is not responsible for resolving any disputes arising from these statements between you and any other parties. If you are self-fulfilling orders, you agree that you shall be fully responsible for producing and reviewing all product items, shipping methods, and tax rules set up for selling. You must ensure these items adhere to their description and will not mislead the purchaser in any way. You shall be fully responsible for processing and shipping of orders to the purchaser, in accordance with the terms of order. You are also responsible for dealing with any disputes, cancellation/refund, and exchange of orders. Purchaser of these print and other products hereby agree to deal with the offerer of sale (the photographer) in case of any requests and disputes. If you are using the lab-fulfillment option, you agree to the Terms of Sale, Return/Exchange Policy set out by LyncPix as follows. You shall be fully responsible for ensuring your images have the sufficient resolution, and are in the current settings for the products you set up to sell. LyncPix and its Print Vendors are not responsible for any cost or losses resulting from incorrect resolution or settings of the images. You agree to pay the cost of the products, the appropriate transaction fees to LyncPix, as well as the credit card processing fees charged by third party payment service provider. You are fully responsible for setting up tax rules, and collecting and remitting the appropriate sales tax in your jurisdiction. You are responsible for dealing with any disputes, cancellation/refund, and exchange of orders. If you are selling digital downloads via Store, you must set out your own Digital image license. LyncPix provides no warranties for digital image licenses and is not liable for any dispute arising out of any digital image license agreement. LyncPix is also not responsible for enforcing any digital image license agreement. These Terms of Sale is applicable to your purchase of any prints and other products through the LyncPix Store and fulfilled by our Partner Print Vendor. In the event of any conflict between these Terms of Sale and the other provisions of the Terms such as ones set up by the photographer, these terms of sale will prevail. These Terms of Sale may not be altered or amended in any way, and all sales are expressly conditioned upon your agreement to these Terms of Sale. You are responsible for any taxes that you are obligated to pay or the photographer may collect from you with regards to the purchase of the products. You are also responsible for the taxes or fees in the event they are later determined to be payable on the sale. Such taxes may be added to the purchase price and reflect on your invoice or receipt. You are responsible for paying all shipping charges applied to the order, the charges will be shown on the checkout page and it is subject to verification and to correction or change. We will contact you to correct the shipping before processing if there’s any changes, and you will have the chance to cancel your order. All orders are shipping FOB shipping point, which means the title of the goods passes to you upon shipment. LyncPix Print Vendors will use reasonable efforts to ship all orders within the estimated delivery time applicable to the method of shipping you have chosen at time of order. LyncPix or the Print Vendors reserve the right to substitute another shipping vendor to deliver the order. LyncPix is not responsible for any delays in shipping and other costs that may arise from the delay. All prints and other products purchased are non-refundable and non-exchangeable. If the prints or products you received is physically defective, you are responsible for contacting the photographer within thirty (30) days of your receipt of the products, and work out the necessary arrangements for either a refund or a replacement. The foregoing right to return any order within thirty (30) days to your photographer is your sole and exclusive remedy, and LyncPix expressly disclaims and excludes all warranties, expressed or implied, regarding the purchase of any products. LyncPix will do its best to present accurate information in the product options however we do not warrant that the product description, photos and pricing are accurate, complete, reliable, current or error-free. All size dimensions are approximate, we make reasonable efforts to accurate display all details of the product offerings, including the applicable color, and the applicable crop (in the case that the product needs cropping to fit the selected sizes), please note that the actual color or crop you will see might be different. LyncPix Print Vendors reserve the right to format manipulate or modify the image as may be required to satisfy a particular order. In the event of an error, we reserve the right to correct such error and charge the correct price or cancel your order. You must agree to the digital image license set forth by the photographer prior to purchasing a digital download product. You acknowledge that LyncPix provides no warranties for any digital product license and you are entering into the license agreement with the photographer. LyncPix is not responsible for enforcing the agreement nor resolving any disputes. By accepting these Terms of Service, you acknowledge and agree that all content presented to you on this site is protected by copyrights, trademarks, service marks, patents or other proprietary rights and laws, and is the sole property of LyncPix Ltd. You are only permitted to use the content as expressly authorized by us or the specific content provider. You may not copy, reproduce, modify, republish, upload, post, transmit, or distribute any documents or information from this site in any form or by any means without prior written permission from us or the specific content provider, and you are solely responsible for obtaining permission before reusing any copyrighted material that is available on this site. Any unauthorized use of the materials appearing on this site may violate copyright, trademark and other applicable laws and could result in criminal or civil penalties. Neither we or our Affiliates warrant or represent that your use of materials displayed on, or obtained through, this site will not infringe the rights of third parties. Nothing in these Terms of Service grants you any right to use any trademark, service mark, logo, and/or the name of LyncPix Ltd.
All intellectual property rights in the Service and its database, including copyrights, trademarks, industrial designs, patents and trade secrets – are either exclusive property of LyncPix Ltd or exclusively licensed to LyncPix Ltd. The Service is protected, among others, by United States and Worldwide Copyright and Trademark Law or by provisions prescribed by any other law, in the United States and abroad. Copying, distributing, publicly displaying, offering to the public via communication, transferring to the public, modifying, adapting, processing, creating derivative works, selling or leasing, any part of the Service, in any manner or means without the prior written consent of LyncPix Ltd, is strictly forbidden. Wedup, and other trade and/or service marks are property of LyncPix Ltd and may not be used in any of the aforementioned means. LyncPix Ltd may protect the Service by technological means intended to prevent unauthorized use of the Service. You undertake not to circumvent these means. Without derogating LyncPix Ltd’s rights under these Terms or under any applicable law, infringement of the rights in and to the Service will, in and on itself, result in the termination of all your rights under these Terms. In such an event, you must immediately cease any and all uses of the Service, and within your obligations to LyncPix Ltd, you undertake to do so. You acknowledge and agree that upon receipt of a notice of a claim of copyright infringement, we may immediately remove the identified materials from our site without liability to you or any other party and that the claims of the complaining party and the party that originally posted the materials will be referred to the appropriate Copyright Office for adjudication. ALL SERVICES ON THIS SITE ARE PROVIDED ON AN “AS IS” AND “AS AVAILABLE” BASIS WITHOUT WARRANTY OF ANY KIND, EITHER EXPRESS OR IMPLIED, INCLUDING, BUT NOT LIMITED TO,THE WARRANTY OF NON-INFRINGEMENT. WITHOUT LIMITING THE FOREGOING, WE MAKE NO WARRANTY THAT (A) THE SERVICES AND MATERIALS WILL MEET YOUR REQUIREMENTS, (B) THE SERVICES AND MATERIALS WILL BE UNINTERRUPTED, TIMELY, SECURE, OR ERROR-FREE, (C) THE RESULTS THAT MAY BE OBTAINED FROM THE USE OF THE SERVICES OR MATERIALS WILL BE EFFECTIVE, ACCURATE OR RELIABLE, OR (D) THE QUALITY OF ANY SERVICES, OR INFORMATION PURCHASED OR OBTAINED BY YOU FROM THE SITE FROM US OR OUR AFFILIATES WILL MEET YOUR EXPECTATIONS OR BE FREE FROM MISTAKES, ERRORS OR DEFECTS. Content available through this site often represents the opinions and judgments of an information provider, site user, or other person or entity not connected with us. We do not endorse, nor are we responsible for the accuracy or reliability of, any opinion, advice, or statement made by anyone other than an authorized LyncPix spokesperson speaking in his/her official capacity. Please refer to the specific editorial policies posted on various sections of this site for further information, which policies are incorporated by reference into these Terms of Service. Upon a request by us, you agree to defend, indemnify, and hold us and our Affiliates harmless from all liabilities, claims, and expenses, including attorney’s fees, that arise from your negligent use or wilful misuse of this site. We reserve the right, at our own expense, to assume the exclusive defense and control of any matter otherwise subject to indemnification by you, in which event you will cooperate with us in asserting any available defenses. We provide multiple security options for you to protect the privacy of your content. You are encouraged to familiarize yourself with the various settings to help you properly manage your account. You hereby acknowledge and understand that all content you upload to the platform may become accessible to the public, and it may be used, downloaded, linked to, and archived by others, and may appear on other websites and in search engine results. We will take all reasonable effort to protect your account, privacy and content, however we cannot guarantee absolute security of your account and all the content you have provided. We cannot guarantee that our security measures will prevent any third party, or hackers from illegally gaining access to your account and content, and we assume no responsibility for any illegal access of your account and content as a result. You accept all risks of any unauthorized access to all information you provide to LyncPix, including but not limited to registration information, content, and account information. In the case that you are aware of any unauthorized access of your account, password and/or content, you must notify LyncPix immediately. In the event that you have obtained user information through Email Registration or Orders, you hereby consent that you will not use user information such as their name, email, and address in any manner except as may be specifically authorized by us. Emails collected through Email Registration and Orders may not be used for sending unsolicited emails that are not directly related to their gallery and without their explicit consent. You agree to safeguard this information and you may not share such information with any third parties. Although this site may be accessible worldwide, we make no representation that materials on this site are appropriate or available for use in locations outside North America, and accessing them from territories where their contents are illegal is prohibited. Those who choose to access this site from other locations do so on their own initiative and are responsible for compliance with local laws. Any offer for any product, service, and/or information made in connection with this site is void where prohibited. You agree that we may, in our sole discretion, terminate or suspend your access to all or part of the site with or without notice and for any reason, including, without limitation, breach of these Terms of Service. Any suspected fraudulent, abusive or illegal activity may be grounds for terminating your relationship and may be referred to appropriate law enforcement authorities. All notices to a party shall be in writing and shall be made either via email or conventional mail. Notices to us must be sent to the attention of Customer Service at support@lyncpix.com. Notices to you may be sent to the address supplied by you as part of your Registration Data. We may send you notifications triggered by certain actions in your account; you may opt out of some of these notifications by updating the settings in your account. In addition, we may broadcast notices or messages through the site to inform you of changes to the site or other matters of importance, and such broadcasts shall constitute notice to you at the time of sending. These Terms of Service constitute the entire agreement and understanding between us concerning the subject matter of this agreement and supersedes all prior agreements and understandings of the parties with respect to that subject matter. These Terms of Service may not be altered, supplemented, or amended by the use of any other document(s). Any attempt to alter, supplement or amend this document or to enter an order for products or services which are subject to additional or altered terms and conditions shall be null and void, unless otherwise agreed to in a written agreement signed by you and us. To the extent that anything in or associated with this site is in conflict or inconsistent with these Terms of Service, these Terms of Service shall take precedence. In any action to enforce these Terms of Service, the prevailing party will be entitled to costs and attorneys’ fees. Any cause of action brought by you against us or our Affiliates must be instituted with one year after the cause of action arises or be deemed forever waived and barred. You may not assign your rights and obligations under these Terms of Service to any party, and any purported attempt to do so will be null and void. We may free assign our rights and obligations under these Terms of Service. In addition to any excuse provided by applicable law, we shall be excused from liability for non-delivery or delay in delivery of products and services available through our site arising from any event beyond our reasonable control, whether or not foreseeable by either party, including but not limited to, labour disturbance, war, fire, accident, adverse weather, inability to secure transportation, governmental act or regulation, and other causes or events beyond our reasonable control, whether or not similar to those which are enumerated above. Any failure by us to enforce or exercise any provision of these Terms of Service or related rights shall not constitute a waiver of that right or provision. Except as explicitly noted on this site, the services available through this site are offered by Lyncpix.com. If you notice that any user is violating these Terms of Service, please contact us at support@lyncpix.com.